A few years ago I put together a review/guide book for the AP Physics 1 course the College Board recently released. The project was started around 2009, but took several years to complete as the scope and direction of the College Board’s AP Physics 1 course continued to evolve, as more and more information about the course was released, modified, re-released, etc. It has done fairly well, and after the release of the first exam, a second edition was released, which included minor edits, modifications, and rephrasings in the main text, but also incorporated a significant number of more challenging questions in the appendix, though many of them remain numerically focused. The goal of this book was never to be a “sole source to success in AP Physics 1.” The AP Physics 1 course is a VERY challenging introductory physics course, which requires a strong foundation in fundamental physics principles, logical problem solving, and transfer of basic concepts to new and unique situations. In my humble opinion, building skills of this sort requires more than a review book. It requires more than videos. It requires extensive hands-on work with applications utilizing the concepts, individual and group problem solving, debate, discussion, and research. It’s a very high level of expectation for what has been largely touted as an introductory physics course. For many, AP Physics 1 will be the only physics course they take. I am concerned that the course offers only a subset of what I would like to see in a general survey course of physics. Though it covers basic circuits, it is light on electrostatics. Though it covers mechanical waves, it doesn’t touch electromagnetic waves, optics, or modern physics. If these were the only topics my students were introduced to in their only physics course, I feel I would be doing them a disservice, and not providing them an opportunity to see more of the breadth and beauty of the field I so love and enjoy. The AP1 Essentials book, as written, was designed as the book I’d want to use with my students. The book which I’d ask them to read outside of class (coupled with video mini-lessons) so that when they arrived in class, they’d have some level of exposure to the basic material allowing us to use our class time more efficiently for those deeper explorations into the topics under study. Public response to the book has been strongly bimodal. Overall reviews are very positive (4.5/5 stars on Amazon.com), with the primary criticisms and 1-star reviews focusing on the book utilizing too much numerical problem solving, and focusing on basic problems that are “too easy” compared to the actual AP 1 test questions. These are VERY valid criticisms, and I agree with them. However, in the context in which the book is intended to be used, these criticisms are inconsistent with the book’s purpose. A grader of this year’s AP Physics 1 exam recently stated that he was surprised to learn that “not including the date, birth date and school code, a student could have made a perfect score on the whole exam without writing down a single number.” I find this extremely troubling. I am in favor of questions that test understanding, but I also believe that many physics students who go on to successful careers in STEM fields learn by first mastering the calculations, mathematics, and numeracy of problems, and over time build deeper conceptual understandings as they recognize patterns in their answers. There is a place for these conceptual and symbolic problem solving exercises in AP Physics 1 and on the AP Physics 1 exam, but there is also a significant place for what I’ll call physics numeracy for lack of a better term — traditional problem solving that involves recognizing appropriate relationships, manipulation equations, finding a numerical answer, and verifying that numerical answer makes some sort of physical sense. Further, I strongly believe that the College Board’s vision for the AP program should focus on providing opportunities for high school students to earn college credit consistent with the courses offered by most colleges. More simply, the AP courses should strive to mimic what colleges are offering and testing in their corresponding courses. In the case of AP Physics 1, the College Board is attempting to lead the way in physics education reform. Regardless of personal opinions on the direction of the AP Physics 1 curriculum and exam, which may very well be valid, a change of this sort shouldn’t be led by the AP program, but rather mirrored by the AP program as it becomes the norm at colleges and universities. Back in December, I started work on a third edition of the AP Physics 1 Essentials book, with the goal of migrating the book closer to style of the AP Physics 1 exam. It’s now late June, and the third edition is well over half done. I have no doubt if I continued on this course, I could have the third edition completed in time for the book to hit the shelves in late August. The third edition, as currently being drafted, however, won’t see the light of day. Since I started this revision effort, I haven’t felt good about the work I’ve been doing. Though I do believe I am making a book that is more closely aligned to the AP Physics 1 exam, I’m moving further and further away from the book I’d want to use with my AP Physics 1 students. Regardless of what the College Board is asking for on the AP Physics 1 exam, I want my students to be best prepared for their future endeavors, which may include AP Physics 2, AP Physics C, and their ongoing academic courses in the sciences. That will, most assuredly, require strong physics numeracy skills. And it will require students to learn how to learn independently. There is a place for physics modeling, for building understanding and for MANY of the ideals inherent in the AP Physics 1 curriculum. But there’s also a place for the traditional course and problem solving skills. This debate doesn’t have to be an either/or proposition. There’s definitely room for a happy medium including aspects of both viewpoints. Personally, however, I can’t continue work on a third edition of the AP Physics 1 book when in my heart I strongly feel I’m doing my students a disservice in their overall physics education and creating a lower-quality product, even if it means more one-star reviews and critiques that the book doesn’t match the AP 1 exam. Maybe someday I’ll change my mind, but Friday afternoon I took all the changes to the third edition, zipped them up, copied them somewhere safe, and removed them from my computer. I strongly believe there will be a 3rd edition of the AP Physics 1 book. I see TONS of opportunities for improvement. But the work I’ve been doing for the past six months to make the book more consistent with the AP 1 exam isn’t really an improvement, it’s an attempt to improve student scores on a test I believe has significant flaws, at the expense of other important skills. If I’m honest with myself and focus on doing what is truly best for my kids, I want to see them continue to use the book as an introduction to the essential concepts of AP Physics 1, including significant algebraic manipulation and problem solving, and leaving more time in the classroom for application and hands-on activities. I still feel the book is a great tool for students preparing for the AP 1 exam, and I’m going to keep significant numeric problem solving with basic concept application, and leave the deeper-dive and conceptual understanding questions for class time when the instructor is available to direct, guide, and differentiate as needed. This is not meant as an attack on the AP Physics 1 Curriculum, the design committee, the test writers, or any others. I am honored to work in a profession where so many are so passionate about trying to do what’s best for their students and the field itself. Sometimes we disagree on the path forward, and that’s OK. And I could be wrong. I often am. I admire the effort and the vision so many have put into this work, and the feedback and support I’ve received and continue to receive for this book, both in praise and in criticism. 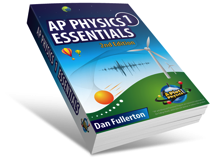 The post AP Physics 1 Essentials — The Mystery Third Edition appeared first on Physics In Flux.